I'll be presenting the largely unknown story of the long segregated communities Kinloch and Ferguson this Friday in Grand Center. My piece is part of the Artists' Showcase being held at the Public Media Commons located between Channel Nine and St. Louis Public Radio. 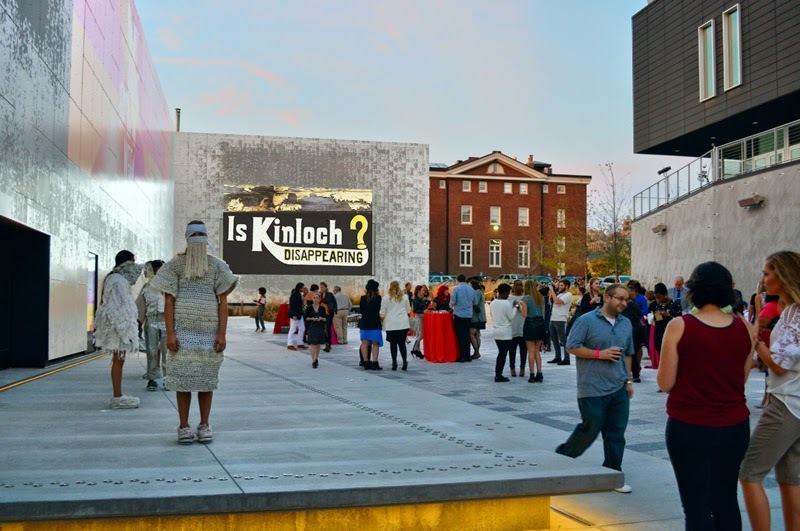 The program will feature a series of live and multimedia pieces created just for this event. Check out the Facebook Event page for more details. Advertisement for new suburban development, 1895. 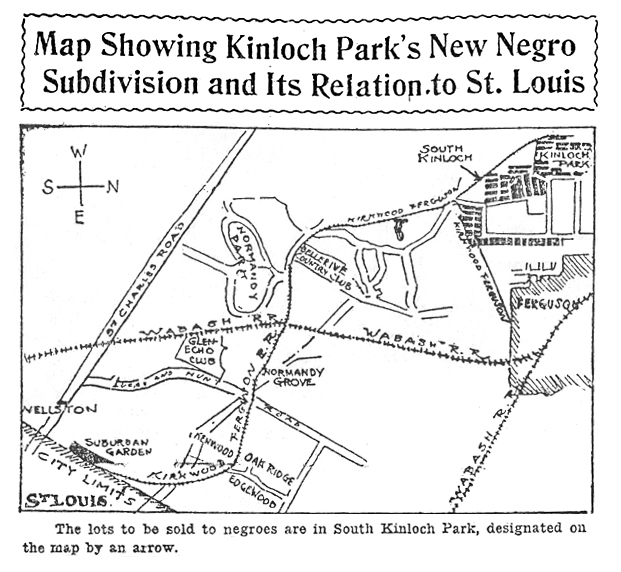 Many of the white families who built homes in the "beautiful highland suburb" of Kinloch Park in the late 19th Century brought their Black servants with them and set aside a portion of the community for them to live with their families. Separate schools were set up for white and black students. 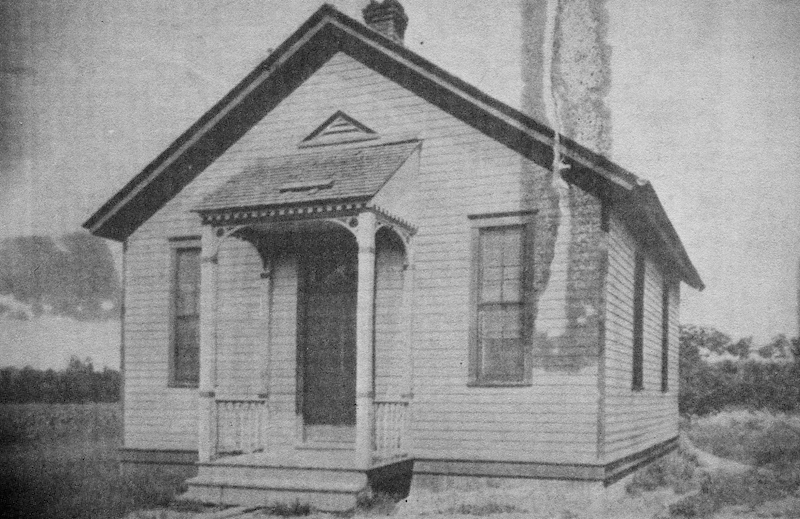 The first school for Black children was a one-room frame structure, the Vernon School, built in 1885 which suggests there must have been a critical mass of families living there at the time. The Vernon School was the first school built for Black children in St. Louis County. 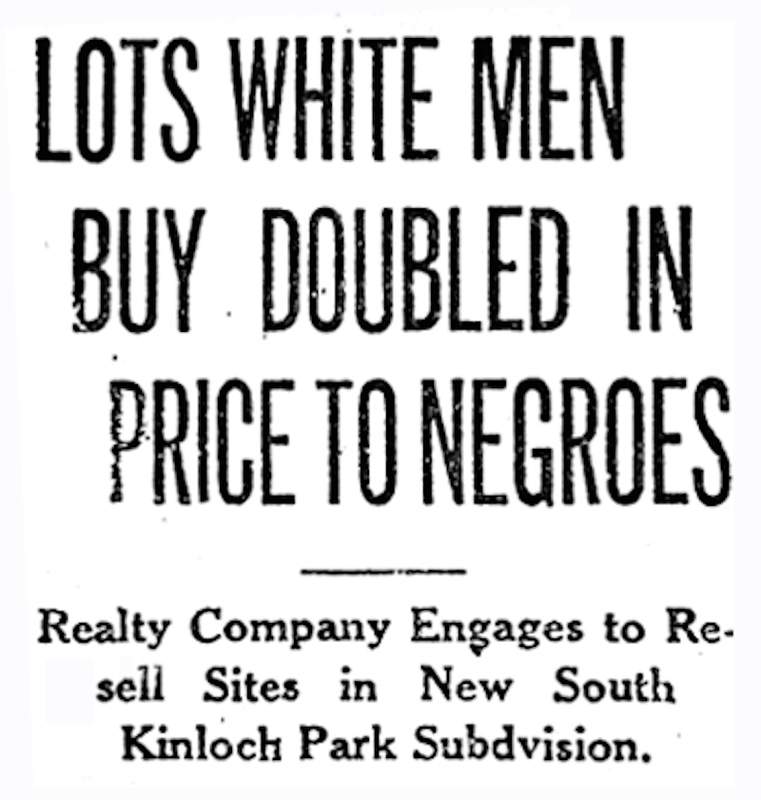 In the early decades of the 20th Century, realtors devised a way to create a suburb for Blacks. 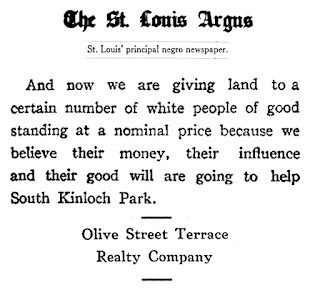 Land just West of Ferguson was marketed to Black families by the Olive Street Terrace Realty Company. 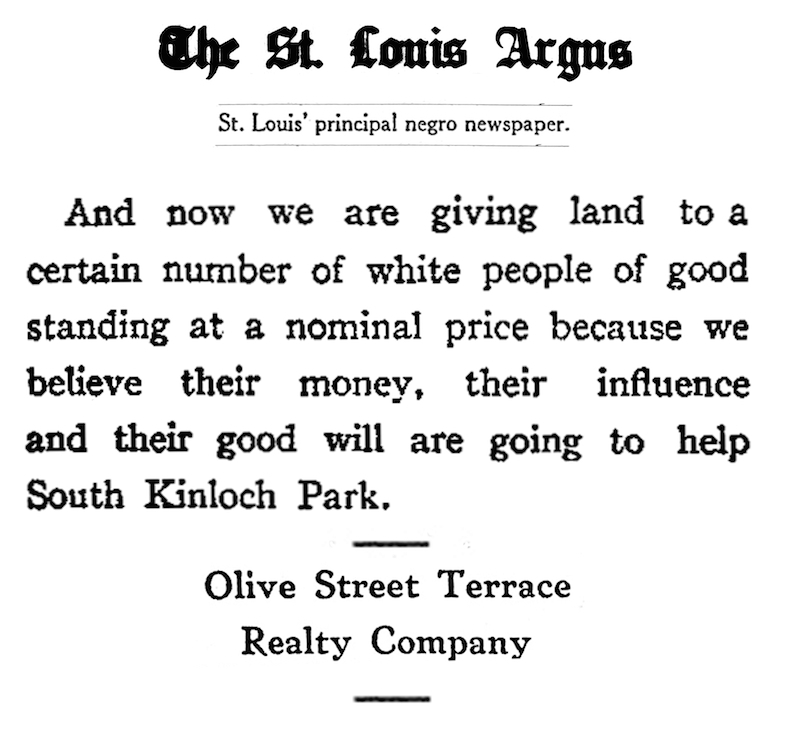 Here's an excerpt from an advertisement they placed in the St. Louis Argus dating from 1917 which suggests the mechanism for financing the transactions with the blessing of a bank. 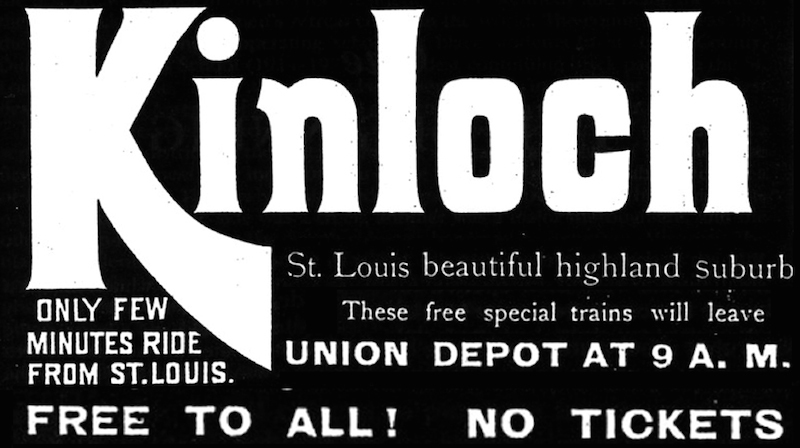 Excerpt from an advertisement in the St. Louis Argus newspaper. 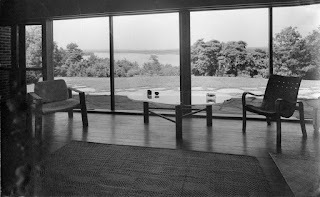 This practice was apparently seen as a legitimate means for investing in land development and profiting from laws which prohibited Black from buying property or obtaining loans. 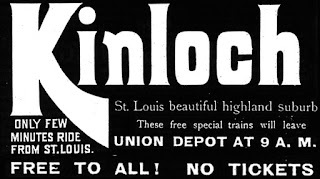 Headline of an article in the St. Louis Post-Dispatch about unique investment opportunity. This practice was apparently common knowledge. 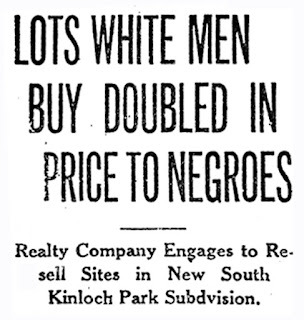 It was known as the "Brooklyn Method" having been first developed as a means of selling land to Blacks across the river in Brooklyn, Illinois. 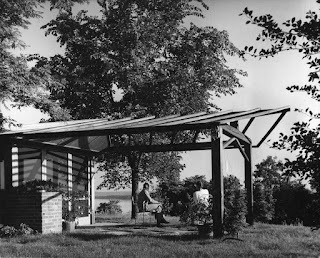 A similar use of "straw buyers" was often used in St. Louis to circumvent restrictive covenants and similar limitations. 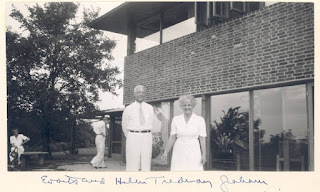 To find out more, please come to hear the rest of the remarkable story of this community. 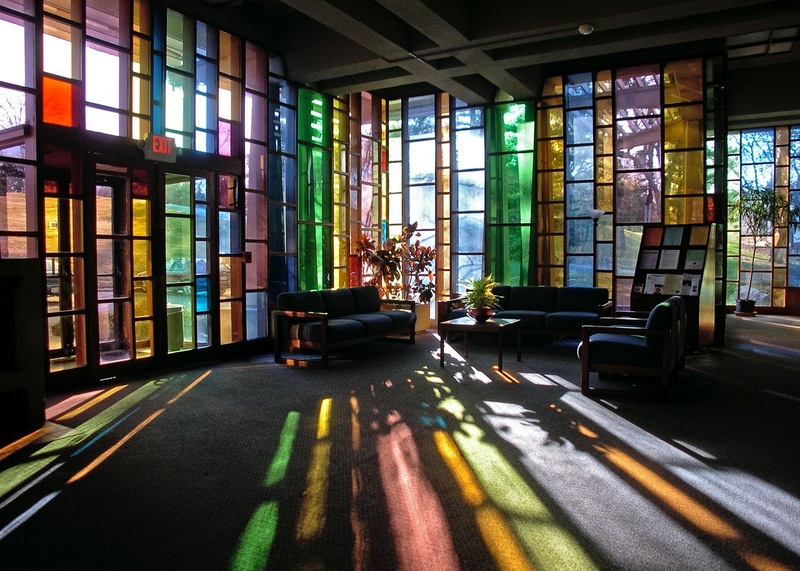 You are invited to the Ethical Society's 50th Anniversary Celebration on Saturday, April 25 at 2pm. Ethical Society, photograph © Andrew Raimist. I will present “Ethical Society Building 50th Anniversary Celebration: Reflections on Harris Armstrong’s Design” shedding light on the architect’s creative process and the Society’s journey from its original St. Louis City home in the Sheldon Memorial to the current iconic mid-century modern structure on Clayton Road in 1965. 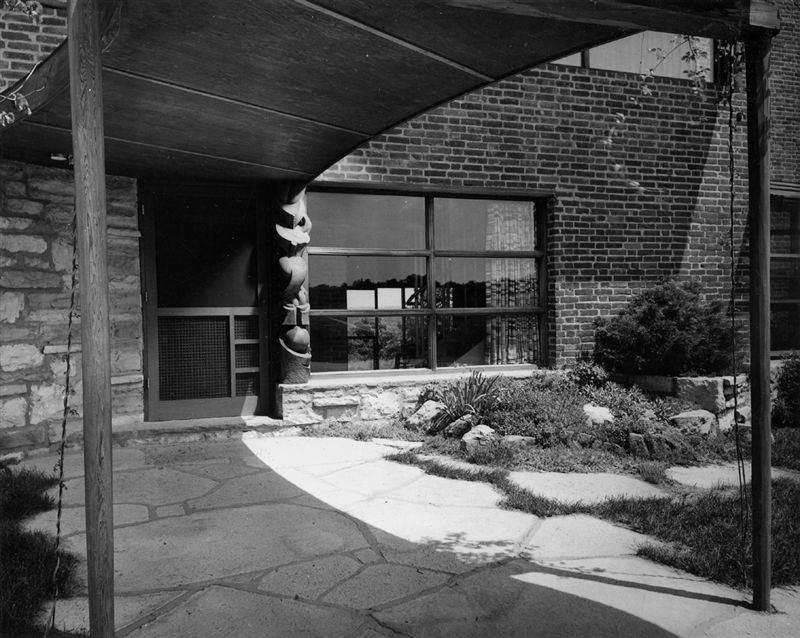 Ethical Society Entry Hall, photograph © Andrew Raimist. Preliminary design and models will be presented as well as the evolution toward its ultimate form. 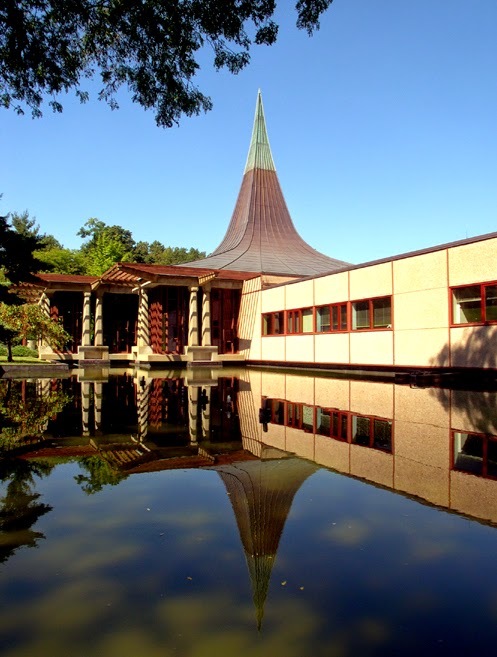 Armstrong's other designs for religious structures will be discussed as well as significant modernist religious structures designed by his contemporaries. Ethical Society Meeting House, photograph © Andrew Raimist. A reception will follow the presentation which is free and open to all. 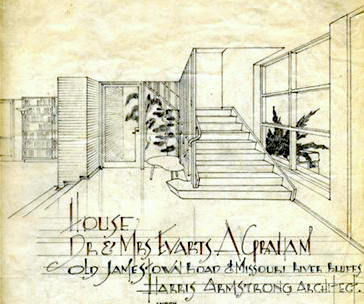 Tonight, Thursday, April 16 there are three items of architectural interest taking place at the Saint Louis Public Library's Central Branch, 1301 Olive Street, St. Louis, MO 63103. Phone: (314) 241-2288. 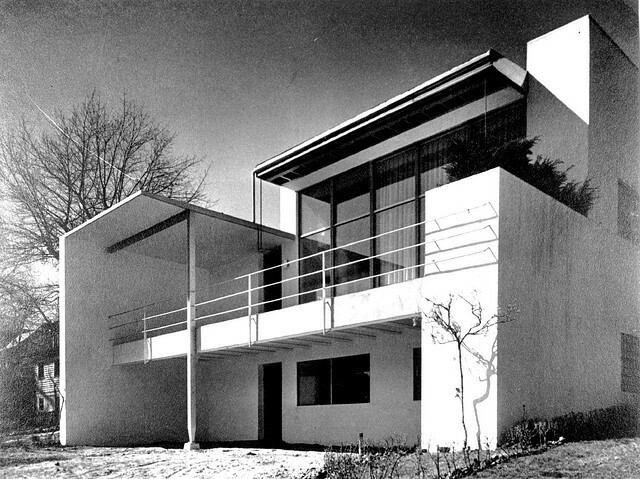 This month’s lecture in the Architecture Around the World Series, presented by the Steedman Architectural Library and the Society of Architectural Historians, will feature Paul Hohmann, architect at E+A Architecture and blogger at Vanishing STL, as he discusses “From Abbeys to Street Art – Germany and Austria along the Danube.” The program takes place in Central’s Carnegie Room on April 16 at 6:30 p.m.
From 6 to 6:30pm, visitors can step inside and view one of Central’s most special rooms, the Steedman Architectural Library. The group will then move to the Carnegie Room for Paul Hohmann’s lecture. You can see the Central Library's original post here. 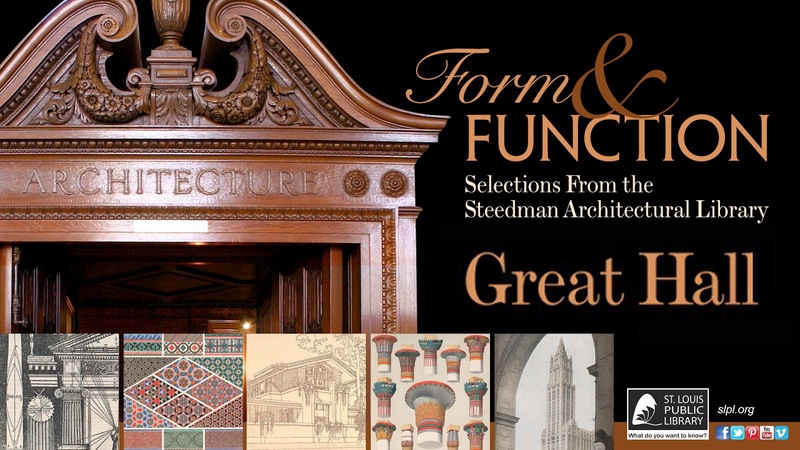 From some of the Steedman Collection’s most important and beautiful items will be on public display in Central Library’s Great Hall. 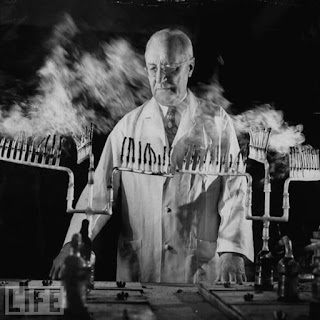 The exhibit affords the general public a rare chance to view truly important materials and learn more about them. 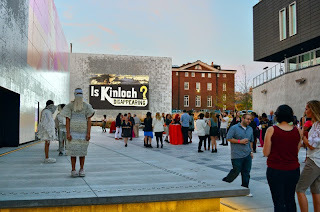 This exhibit will be closing in May 2015. Link to the Library's announcement of the exhibition. 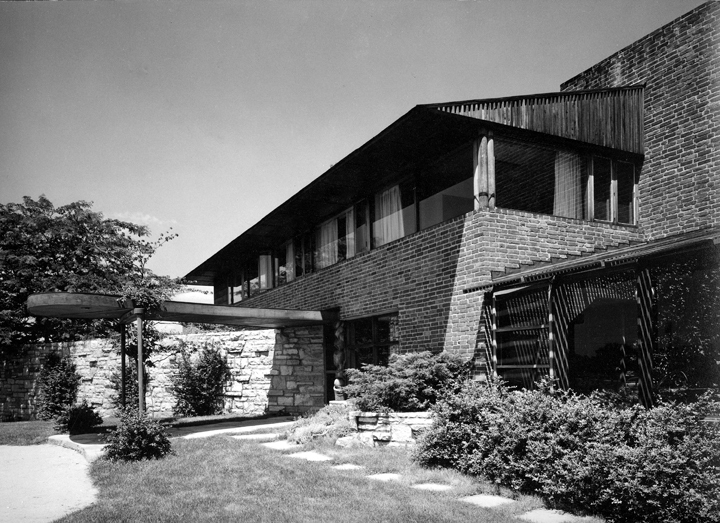 On Thursday, April 14, 2015, Andrew Raimist, AIA and John Guenther, FAIA will be leading a bus tour of significant works of MCM architecture at the conclusion of the Mid-Century Modern Structures symposium sponsored by the National Park Service taking place this week in downtown St. Louis. For anyone interested, it's still possible to purchase an entry pass for some or all of the three-day symposium which has just begun this morning at the Drury Plaza Hotel in downtown St. Louis. 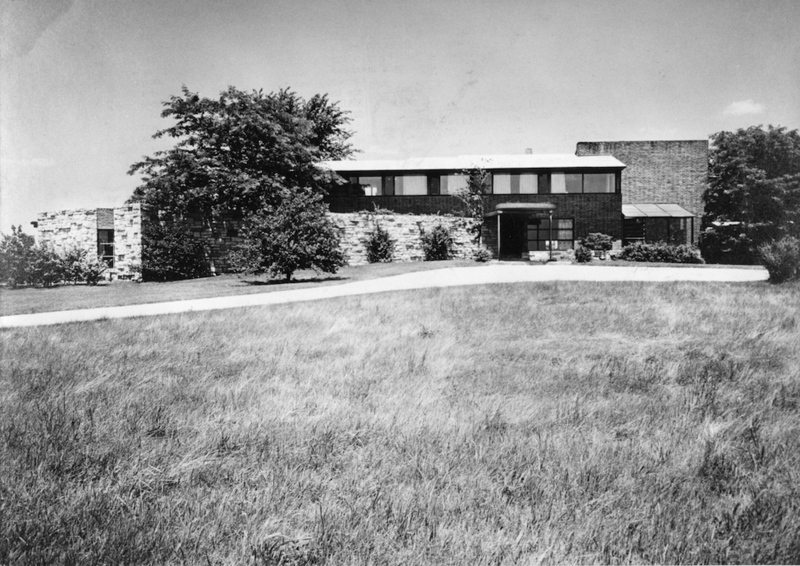 B'nai Amoona Synagogue, Ethical Society, Priory Chapel and Kraus House (left to right). Here's the official description of the tour from the symposium program. 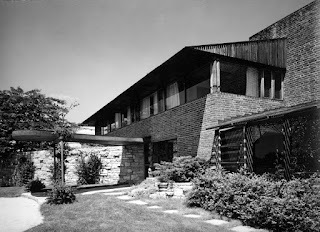 The tour highlights significant Mid-Century Modern buildings by outstanding architects of the period for a variety of project types including commercial, residential and religious structures located around the St. Louis metropolitan area. 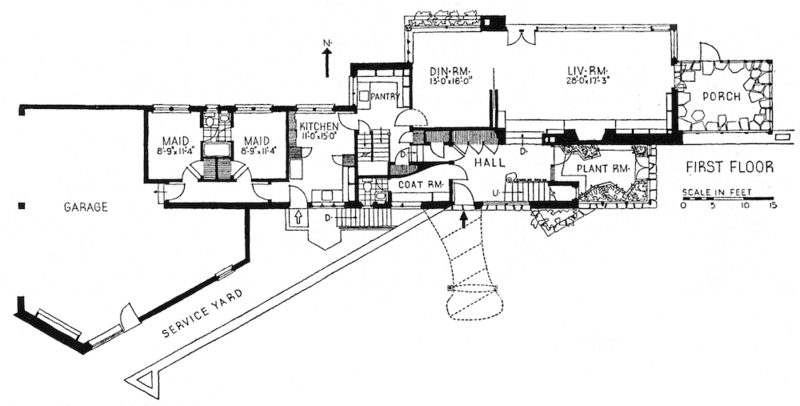 We’ll visit an immaculately restored Usonian house by Frank Lloyd Wright (exterior tour) and a thinshell, parabolic folded-plate concrete church designed by Gyo Obata, FAIA (HOK). We will then drive by a meeting house for the non-denominational Ethical Society by local modernist Harris Armstrong, FAIA, the B’nai Amoona Synagogue (now COCA) by legendary modernist architect Erich Mendelsohn and two structures by local modernist leader Isadore Shank framing the early and high period of MCM architecture. This panel discussion brings together community members from across St. Louis and WUSTL to engage in a conversation that explores the important viewpoints, real challenges, and hard realities faced by residents of North St. Louis City and County. As a result, we hope to identify areas where communities’ genuine needs intersect with the University’s genuine interests, providing opportunities for the WUSTL community to both listen and reach out in meaningful and authentic ways. • Melvin White, President, Beloved Streets of America, Inc.
FREE AND OPEN TO THE PUBLIC. All community members with an interest in the public realm, community development, social justice and related issues are invited to come and share your voice in this collaborative, interactive process. Along with tasty appetizers, we'll have large maps and other paper on which everyone will be invited to draw and express their own thoughts and ideas! 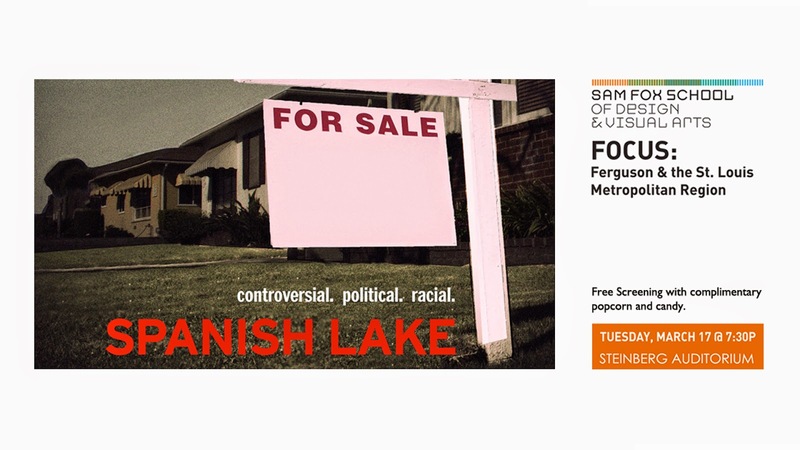 This event is the concluding public discussion of this series of events which included a screening of the documentary film "Spanish Lake" and a bus tour of North St. Louis City and County. 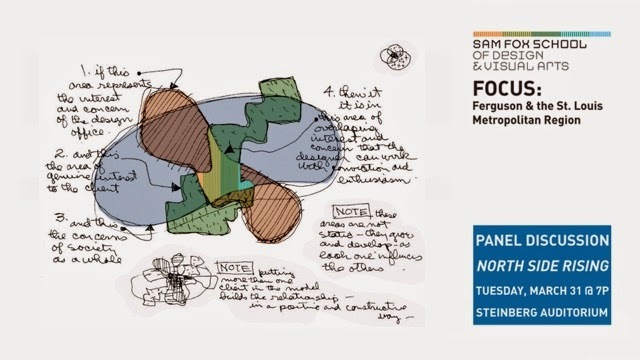 The Sam Fox School presents FOCUS: Ferguson & the St. Louis Metropolitan Region, a series of events that will address the complex economic, political, and racial landscape of North St. Louis City and County. The events following Michael Brown’s shooting death on August 9, 2014, revealed deep divisions within the St. Louis area. The name “Ferguson” has become shorthand for the many problems and conflicts endemic to urban and suburban communities, not only in the St. Louis region but also across our country. The FOCUS series will draw on a range of these questions and issues, investigating the intersecting—and often compounding—roles played by social and economic inequities, racial disparities, white flight, public safety, and housing and economic development. At the same time, the series will grapple with legitimate, thoughtful ways for citizens to effect positive change, with an emphasis on learning how to listen to, understand, and address conflicting voices. 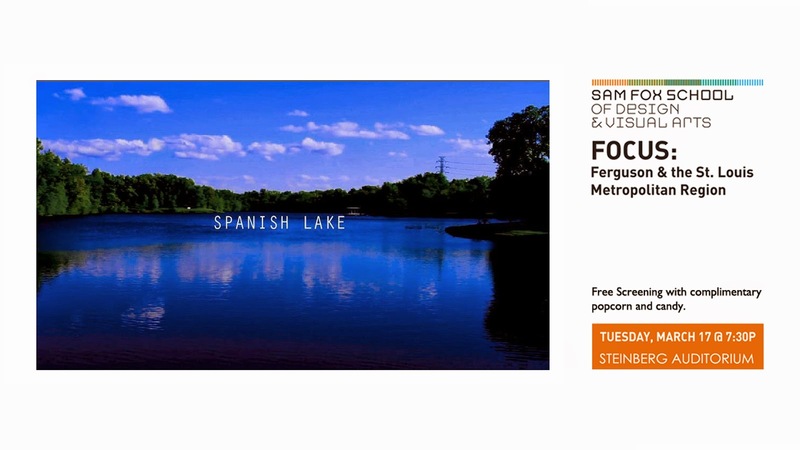 We will be showing the film "Spanish Lake" on Tuesday, March 17 at 7:30 PM in Steinberg Auditorium, Sam Fox School, Washington University in St. Louis. 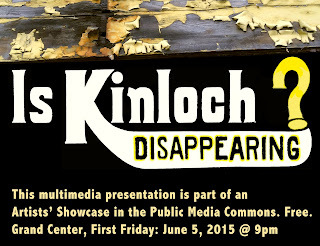 The screening is free and open to the public. We will be providing complimentary popcorn and candy. The screening is the first in a series of events addressing current issues of concern in north St. Louis city and county. 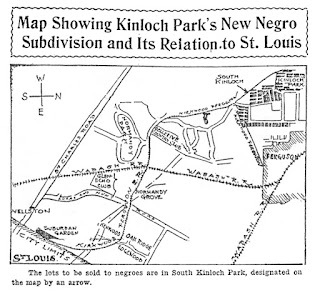 Like Ferguson, Spanish Lake is a community in north St. Louis County which has undergone rapid racial, economic and demographic change in recent decades. The forces driving the societal changes in Spanish Lake parallel many of those in Ferguson. 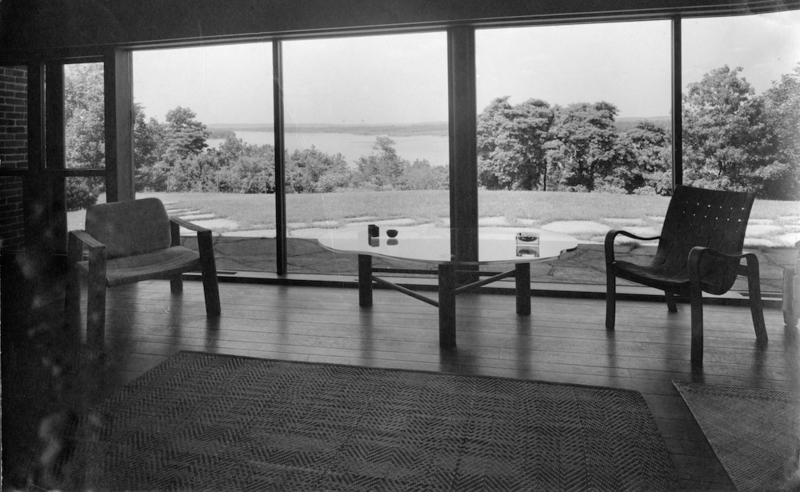 The most significant between them: Ferguson is incorporated as an independent municipality while Spanish Lake remains a part of unincorporated St. Louis County. The film makes clear the important financial, governmental and policy factors driving these rapid changes. One of the films greatest strengths is that we get to hear from individuals on the ground who made different decisions which resulted in the changes we see in the community. We hear people speaking from various viewpoints: White residents who remained or fled, new Black residents, Realtors, landlords and other community stakeholders. The Spanish Lake's history, intersection with the City of St. Louis, Federal and local housing policies along with other social and economic forces are dramatically and poignantly portrayed. 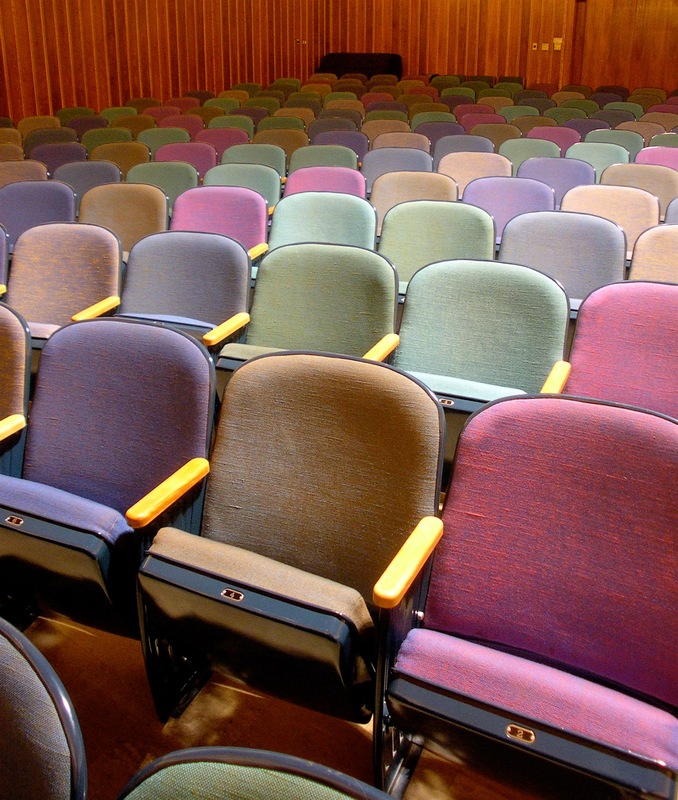 For a period of time following Michael Brown's shooting, St. Louis area theaters withdrew the film from distribution for fear that it might increase anger and frustration in the local community. In this sense, the film was censored from its planned local distribution. Please feel free to share this invitation to others who might be interested in attending. As part of this symposium, John Guenther and Andrew Raimist will be leading bus tours of significant works of St. Louis Mid-Century Modern Architecture. 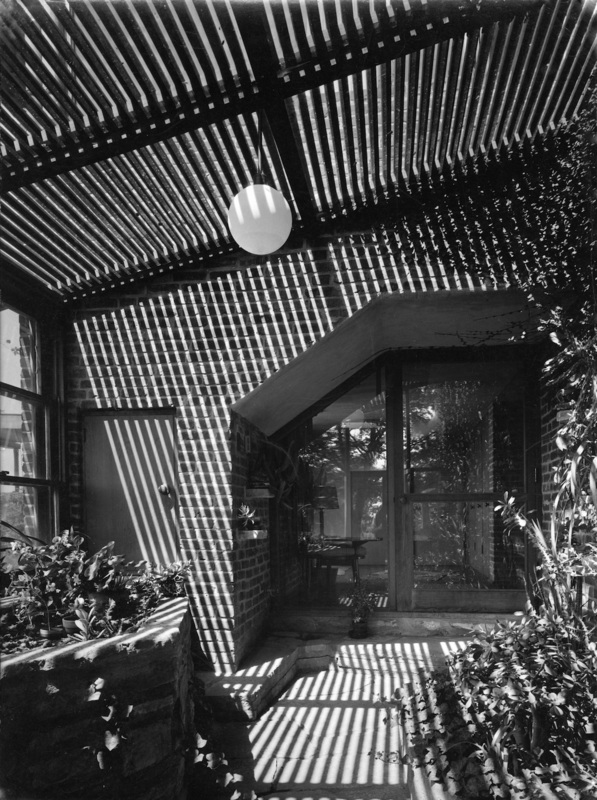 A few of the historic MCM buildings we'll be visiting on our bus tour. 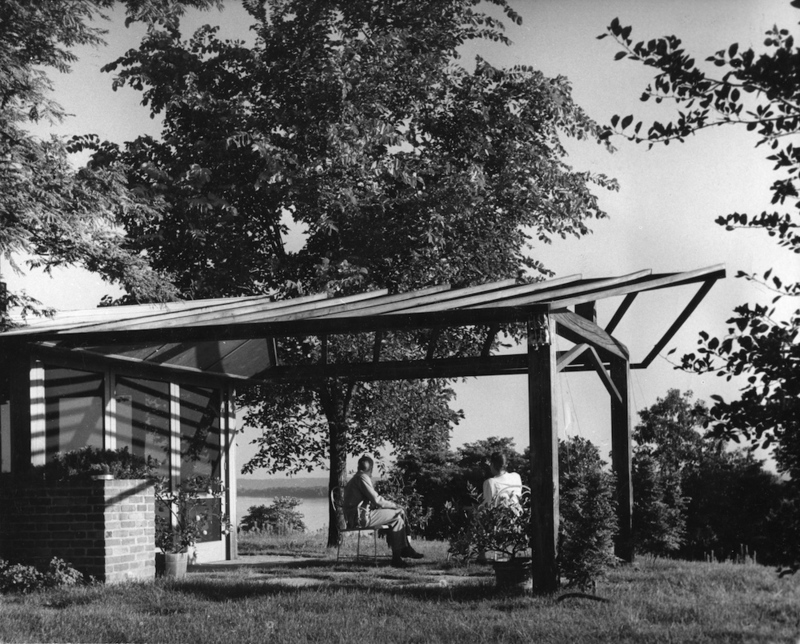 This symposium will reveal the results of the “scratch test” done on the mysterious staining on the Gateway Arch as well as programs on mid-century modern preservation, materials, restoration, engineering, modernism at risk, and the Gateway Arch and its evolving programmatic requirements; just a sampling of programs that all offer AIA HSW credits. 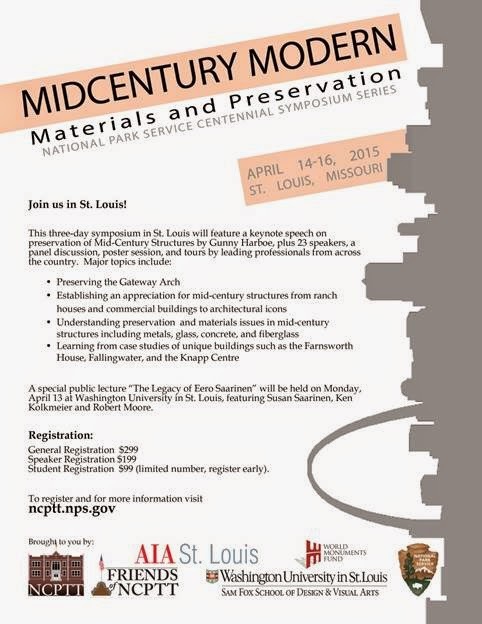 Flyer for the Mid-Century Modern Materials and Preservation Sympsium. 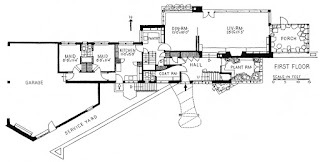 Among the speakers are Gunny Harboe, FAIA of Chicago; Bob Moore of NPS; Ann Dilcher of Quinn Evans Architects; Steve Kelley, FAIA; David Bright of Knoll, Inc. This is a remarkable conference, limited to 200 registrants. Tuesday night reception at Pointe 440 View (formerly known as the Pet Building), all ensuring a wonderful symposium. 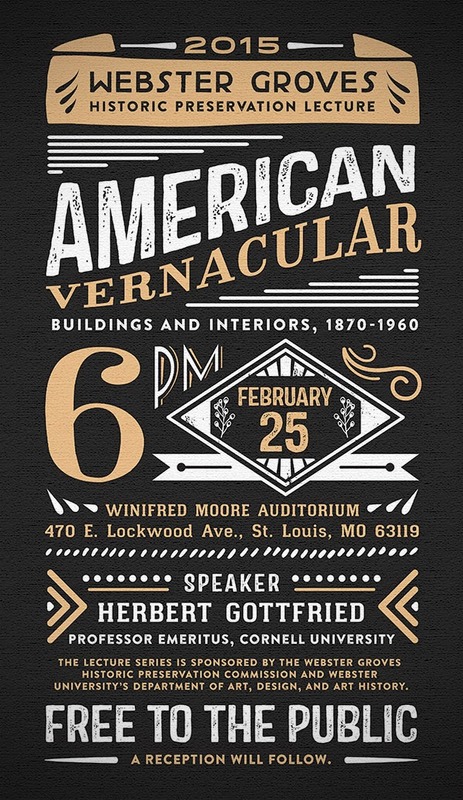 Herbert Gottfried, professor emeritus of Cornell University, will review the American vernacular building types, their history, and the forces that stimulated them. 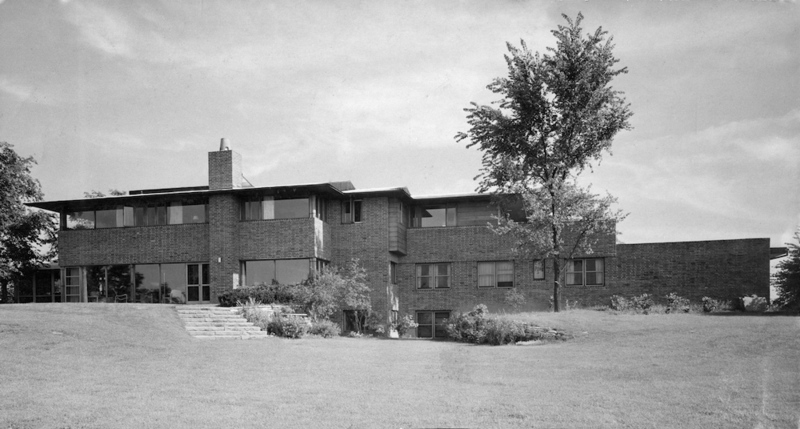 This talk will place Webster Groves within a national architectural context to consider the development of the city’s architecture and urban character over time. 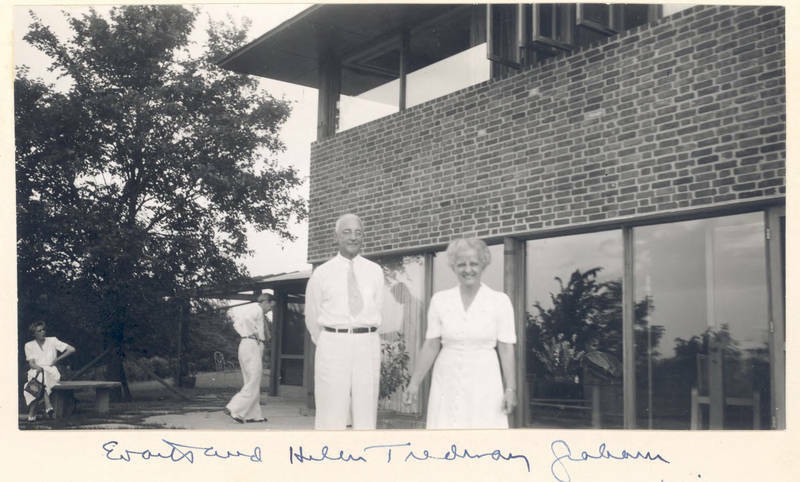 The lecture series is sponsored by the Webster Groves Historic Preservation Commission and Webster University’s Department of Art, Design, and Art History. The lecture is free and open to the public. A reception will follow.